THE Philippines still lacks awareness of and support for free and open source software (FOSS), Commission on Information and Communications Technology (CICT) Secretary Ray Anthony Roxas-Chua III said yesterday. Chua, in his speech during the opening of the Philippine Open Source Summit at the Cebu International Convention Center (CICC) early today, said that despite the existence of FOSS products, many Filipinos still use pirated software. OPEN SOURCE SUMMIT. 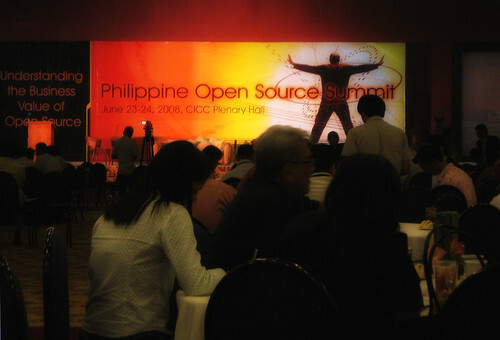 The Philippine Open Source Summit at the Cebu International Convention Center. Click on photo to enlarge image. “Regrettably, however, the more common option for many users is the purchase of pirated copies of proprietary software. There is, therefore, a need to bring open source to the awareness of users as a legitimate option and to provide the required support for its implementation,” Chua said. Open source software are those released under a license that legalizes sharing of the application and building up on it. It got its name from the requirement of making the source code available with the software. Blogger’s note: Hit refresh to read updates. I’m live-blogging event. Vice Mayor Michael Rama, speaking for Cebu City Mayor Tomas Osmena, told the delegates that information and communications technology (ICT) should always be guided by the fact that technology is a human creation and should be usd for the betterment of humanity. In giving an overview of the summit, Cebu Educational Development Foundation for Information Technology (Cedfit) executive director Bonifacio Belen talked about how open source has taken the world by storm.